The beginnings of the The Cooperative Fish and Wildlife Research Unit Program were initiated in Iowa by the cartoonist, political satirist, and conservationist J. N. "Ding" Darling. In the early 1930s, Darling was the commissioner of the Iowa Fish and Game Commission when he created the cooperative wildlife research unit as a joint venture of Iowa State College and the Iowa Fish and Game Commission. In 1934, Darling was appointed director of the Federal Bureau of Biological Survey. In this position, Darling lobbied Congress for support of a nationwide cooperative wildlife research unit program. With commitments from land-grant universities, state natural resources agencies, and ammunition companies, units were established in nine states that represented the breadth of ecosystems across the country (Oregon, Utah, Texas, Iowa, Maine, Connecticut, Virginia, Alabama, Ohio). The Cooperative Units Act (P.L. 86-686) was passed by Congress in 1960, which authorized the unit program as a separate budget item within the U.S. Fish and Wildlife Service. This act also established cooperative fishery units. The Cooperative Fish and Wildlife Program has evolved over the years, including the addition of several new units. 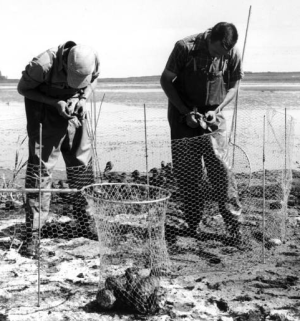 Other significant programmatic changes included combining disparate wildlife and fisheries programs into single units in the 1970s, and moving the unit program from the U.S. Fish and Wildlife Service to the U.S. Geological Survey in the 1990s. The Cooperative Fish and Wildlife Research Units are truly cooperative ventures of federal and state governments, and non-governmental organizations.